The Bailies of Bennachie do not like the present way-markers on Bennachie. We have had discussion with Moray and Aberdeenshire Forest District (MAFD) of Forestry Commission Scotland about them and they agreed with many of the points raised. However, due to financial considerations these way-markers will be on the hill for a few more years but then they will be replaced. We have been promised to be consulted when new way-markers are planned and we will involve the North East Mountain Trust in these discussions. The Bailies, working with MAFD, on the first Saturday of every month run voluntary work parties on the hill. The Bailies undertake varied practical work from basic footpath maintenance, pruning the willow sculpture at Back o Bennachie, maintaining some of the Colony houses etc. To find out about these work parties and other events please look at our web site: www.bailiesofbennachie.co.uk. Meanwhile here is an article about their new Project. The Bailies of Bennachie were formed over thirty years ago to actively encourage the responsible use of Bennachie. The group can boast a membership of over 3,600 and which is still growing. It could rest on its laurels and be smug. Instead, it has decided on a less comfortable but ultimately more rewarding course by questioning its chosen landscape down to its very roots. This can be an uncomfortable experience. It involves asking difficult questions to which the answers might not be as expected or even desired. With areas of beautiful landscape, we are generally comfortable with things the way they are and hope for them to remain that way. Similarly, we are happy with our notions of how things were with that landscape in earlier times and conceive of that time as a form of golden age culminating in the present. It is made to fit and to suit our hopes and preconceptions. Such preconceptions, it must be noted, are derived from a 21st century mindsets. To undertake an intensive landscape study of a beloved area is, therefore, to risk the detection of unpleasant skeletons dangling in wardrobes. It does, on the other hand, also offer the possibility of greater wonders than had previously been imagined. It might, therefore, be seen to be a bit of a gamble. Nothing daunted, the Bailies have taken their first steps along this Un- way marked track. Bennachie Landscapes is attempting to survey every track, hollow-way, quarry, peat head, ditch, dyke and otherwise unexpected lumps and bumps on the hill. It hopes to marry this with a similarly intensive survey of its geologies and soils as well as its natural flora and fauna. Only from the relative security of the known, is it safe to attempt to proceed backwards into the murky unknown places of the past. That rhythm will have answered the calls of climatic catastrophe, disease, pestilence, religious intolerance, war and greed as well as the more benign effects of warm climatic spells, peace, good ecological management and health. All have left their marks on the hill in various forms: environmental, archaeological and in the histories handed down through folk memory in song and story. All are considered fair game to Bennachie Landscapes. But, this ebb and flow and the turf wars point to how Bennachie can be understood. It is part and parcel of the life which surrounds it. As an islands existence cannot be understood without consideration of its surrounding seascape, so Bennachie cannot be understood without an understanding of the Garioch that surrounds it. Hence the name of the project: Bennachie Landscapes. The landscapes of: upland and lowland; of natural history, flora and fauna, history and archaeology; of these ever-changing landscapes through time; of the idealised, memorialised and symbolic landscapes that they have all helped to bring to life within individual consciousnesses down through the ages. In other words, a lot of landscapes! The Bailies have been joined in this undertaking by a range of lecturers from the departments of Anthropology, Archaeology and History at Aberdeen University. The individual Bailie members bring a wide range of specialist knowledge related to their individual careers and backgrounds as well as their intimate knowledge of the hill. 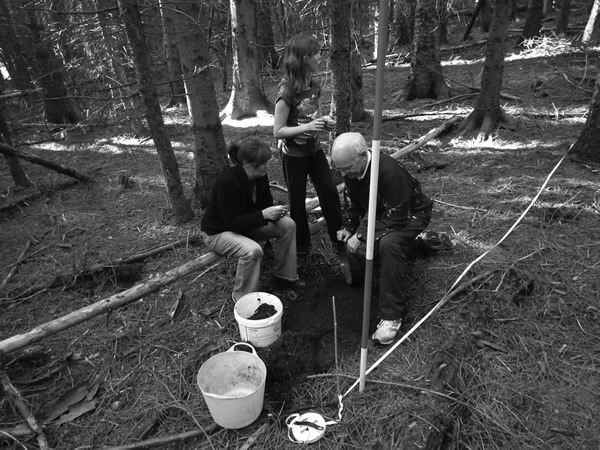 Such wide-ranging knowledge is especially important in the multidIsciplinary task of landscape study. Though the aim of the project is to understand the mechanics of biocultural development, it intends to do this as part of a programme of community involvement. Great emphasis is being placed upon imparting the skills required for the communities around the area to develop and carry out their own local Investigations. The Bailies and University staff will act as the focus and provide the core infrastructure for data collection, archiving and publication. Nothing should be produced that will not find its way back to help inform the local communities. Although Bennachie is not a big mountain, the development of its landscape and that of its hinterland is likely to be instructive for many other locations in the north of Scotland. It is hoped that this project might inspire other similar studies in other areas. It will only be when a range of locations is studied that the regional differences will start to become apparent. Furthermore, landscape management can be only optimistically undertaken when in full possession of an accurate understanding of biocultural development to that point. Without landscape studies, land management is no more than uninformed guesswork tampering with an irreplaceable heritage. Visit www.bailiesofbennachie.co.uk for more info and forthcoming events etc. To get active email me at bennachielandscapes@scottishheritage.org.uk. 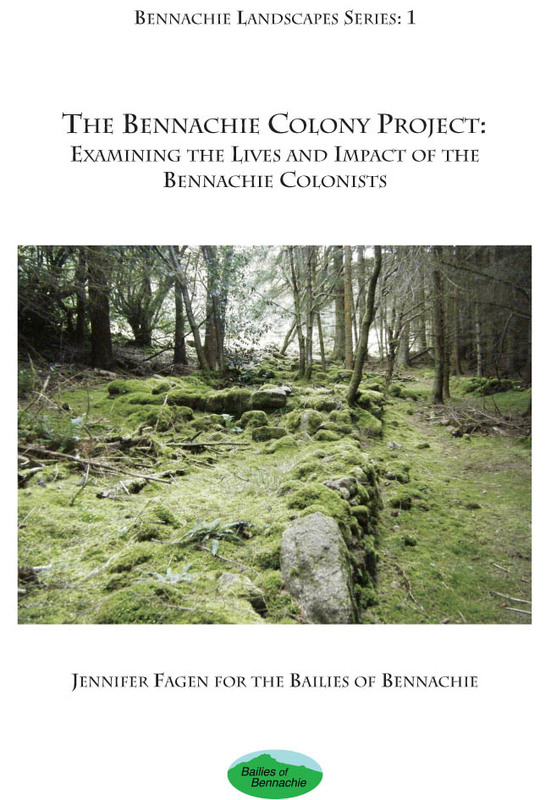 The first publication, Bennachie Landscapes: Series 1, The Bennachie Colony Project is now on sale for £10 from the Bailies and can purchased by visiting the website.